The Supreme Leader Snoke is helpless without the ferocious protection of his Praetorian Guard in the Star Wars film series! 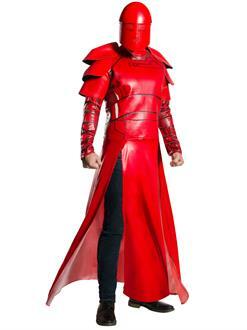 This Halloween, make no mistake and go disguised as a vicious Snoke guard when you wear this fabulous Star Wars Episode VIII - The Last Jedi Deluxe Adult Praetorian Guard Costume! You’ll be decked from head to toe in a brilliant red robe with padded chest and shoulders that give you the muscle power of a giant! You’ll also be unrecognizable in the included two-piece mask! Your Praetorian Guard look is complete from head to toe in this Star Wars Episode VIII - The Last Jedi Deluxe Adult Praetorian Guard Costume! Shop our wide selection of Star Wars character disguises for Halloween!